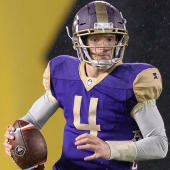 There's still a lot to be figured out from a betting standpoint with the AAF. The first week of the season taught us a few things -- or did it? Is home-field advantage really that substantial? We know that every home team not only won in Week 1, but covered the spread. We know that the lines were based off of some preliminary patchwork and little else. Also, and you can certainly take this with a grain of salt, but there's an argument that two or three of what appear to be the Alliance's lower-tiered teams all played on the road. So maybe the fact that three of the four games were decided by double digits was merely a coincidence in scheduling. In any case, we are continuing to learn more about both the quality of the teams and the trends that develop. That doesn't answer many questions moving into Week 2 (here's how to watch all the Week 2 games), but part of the fun is great unknown, right? Fake it 'til you make it. As Ja Rule once said, "That's not fraud, that's false advertising." On to the picks. Lines are courtesy of Westgate SuperBook. The Stallions can score, as evident in Week 1 against Arizona, but the Iron played solid defense and possession offense against the Express. Only in the fourth quarter, though, did Birmingham start to assert itself. Unlike the Hotshots, I don't know that the Iron have consistent vertical passing game to carve up Salt Lake's defense; they pick and choose their spots. However, it's also worth noting that Salt Lake quarterback Josh Woodrum left with a hamstring injury during last week's loss to the Hotshots. His status for this week is unknown. After they put up a whopping zero points against the Iron, you'd be surprised to find out I have my reservations about the Express. Arizona, on the other hand, is the top team in our power rankings. But if we're assigning more value than normal to being back home, maybe Mike Singletary's team circles the wagons some and puts up more effort. You might see this more on the defense end, though, as there likely isn't an immediate fix for the offensive ineptitude outside of running the ball. I'm going with the Hotshots to win and cover, though it's probably going to take a better offensive effort from the Express to bang the over. The Alamodome was rocking last Saturday when the Commanders sunk the Fleet 15-6. Of the eight home stadiums across the Alliance, San Antonio's might be the toughest to play when the crowd is going. I love the idea of Steve Spurrier's Apollos on a fast track indoors. Receiver Jalin Marshall is going to be a dude to watch. But the Commanders showed plenty of defensive speed of their own. Other than Memphis, Atlanta had the roughest Week 1 of any team. Now it's rewarded with a road trip across the country against a defensive front seven that looks disruptive. Back-to-back games away from home are never fun and this seems like the type of start the Legends will want to forget as the season progresses. There's a reason this game has the lowest point total from Vegas. First one to, what, 20 probably wins it? Maybe 17?